Add vibrant colour to your style with the Fudge Paintbox Hair Colourant; a semi-permanent hair dye that can be applied alone or with other shades to create a customised look. Enriched with moisturising agents and keratin proteins, the formula stains the hair's cuticle for long-lasting effect, whilst conditioning and hydrating strands to leave hair luscious and healthy-looking with enhanced shine. Locks look bold, creative and striking after use. After testing the colour result on a strand of hair, wash hair with your normal shampoo, then towel dry. 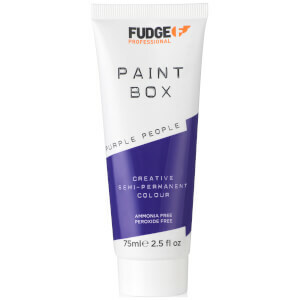 Squeeze Fudge Paintbox into a bowl. Using a tint brush, apply product evenly to the hair, being careful not the stain the scalp. Keep the colour away from the skin at the hairline and nape. Comb the colour through the hair using a wide tooth comb. Lighter shades will require more combing. Processing will take between 15-30 mins. Rinse hair thoroughly away from the face using warm water until all residue has been removed and the water runs clear.